“David is such an innovative, talented artist," said Lindsey Carneal, gallery director, Alan Simmons Art + Design. "He puts his heart and soul into his art, and you feel that personal connection when viewing his work." Alan Simmons Art + Design, a leading art consultant and dealer, hosts artist, David McGlothlin, at Artist Talks at 1415 Slocum, a joint event with Cris Worley Fine Arts artist, Trey Egan, this Saturday, February 9, 2013 in the Dallas Design District. Mr. McGlothlin will speak from 3:30 to 4:00 PM about his work and current show at the Alan Simmons Art + Design gallery. Mr. Egan follows at the Cris Worley Fine Arts gallery from 4:30 to 5:00 PM to discuss his respective work and exhibition. To celebrate upcoming Valentine’s Day, champagne and sweets will be served throughout the event. On January 12, 2013, the Alan Simmons Art + Design hosted a reception and gallery debut solo show for David McGlothlin. The response was most impressive. He has received resounding acclaim from collectors, critics, and the general public. The exhibition will continue through Saturday, February 16, 2013. David has been passionate about and immersed in the world of art since he was a child. His art career spans more than three decades. He began with freelance artwork as an illustrator and painter. David worked on a variety of projects including children’s books (e.g., Barney the dinosaur series) and game boards for Milton Bradley. He also did countless commercial projects locally and nationwide, including store murals and paintings for Arby’s; McDonalds; the Plaza of the Americas; Easter Seals; Lone Star Park; the Galleria Ice Rink; and North Park Mall. 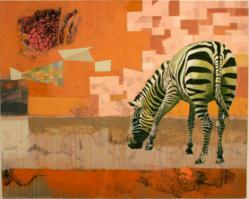 Most noteworthy, David has a permanent mural in the African exhibit at the Dallas Museum of Art. His experience in creating illustrations and paintings for commercial projects helped David to hone his style as a fine art painter. He has participated in many local group shows over the years, including exhibitions at the MAC and 500X galleries, in addition to several open studio showings at his space in the historic Continental Gin building in Deep Ellum. David’s gallery showing at Alan Simmons Art + Design features several bodies of his work, including mixed media pieces on board, canvas, and paper. All of David’s art combines techniques, such as print making, collage, and painting. Bold imagery in his current work embodies subjects ranging from wild animals to family genealogy; elements of pop art; technical drawings; and narratives. A key example is David’s paper bag piece, “Bag It,” which utilizes lunch bags with acrylic paint and ink. “David puts his heart and soul into his art, and you feel that personal connection when viewing his work,” added Carneal. During Artist Talks at 1415 Slocum this Saturday, February 9, 2013, there will be a 10% discount on all art items at the Alan Simmons Art + Design gallery.